Notecard + Envelope 7 x 5 in. Samantabhadra (Tib. Kuntuzangpo), the 'All Good', is the primordial Adibuddha of the Tibetan Nyingma School. 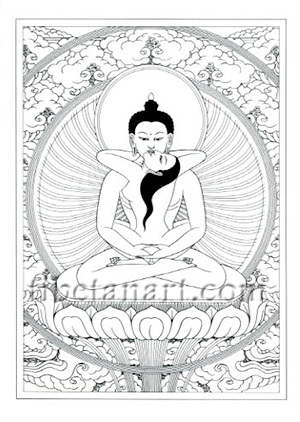 His manifestation as a naked and unadorned blue Buddha represents the primordial essence of the dharmakaya. He embraces his consort Samantabhadri (Tib. Kuntuzangmo), who is white in colour.